At mdi, we feel that the products which we represent make us who we are. That is why we only represent the best manufacturers in their industry. When we take on a product line, our Sales Staff learns all about it in order to better help our customers. We also take the time to build Product-Specific websites that feature all of the information you need to find the right product, plus supplimental information on use and maintenance. This page shows all of the product lines which mdi is proud to represent. Compressed Air Piping with the patented Push-to-Connect Fittings for Air, Nitrogen, Helium, Argon and Vacuum. Compare Transair to conventional methods and you’ll see why tens of thousands of companies choose Transair Aluminum Pipe over costly copper and threaded carbon steel for flawless performance and easy installation! Hannay Reels are the industry standard for reliable and durable hose reels and cable reels. No one makes a better hose reel or cable reel than Hannay. Hannay Reels is the international leader in reel manufacturing as a fourth generation family owned and operated business. Each reel Hannay manufactures is made custom to your specifications in the USA. Known for reliability and performance, Thern manufactures hand winches as small as 500 lb capacity to power winches rated up to 100,000 lbs and cranes with capacities from 500 to 3000 lbs. Thern Winches and Thern Cranes are designed to help you lift, lower and maneuver heavy loads with ease. Becker offers vacuum pumps, pressure pumps, compressors, regenerative blowers and central systems. Their Pumps are noteable for their quiet operation and long vane life. Only Becker Genuine Parts are specially engineered, manufactured and tested to deliver the optimal performance of your Becker vacuum pumps, compressors and blowers. Parker purification and separation technologies offer premium compressed air and gas purity, product quality, technological excellence and global support. 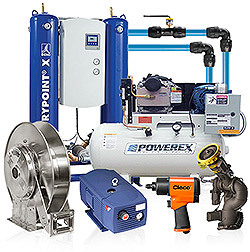 They offer Compressed Air Dryers, Gas Generators, Process Water Chillers, Compressed Air Filters, and Condensate Drains. Safe, clean, more effective – optimised compressed air technology by Beko. BEKO develops, manufactures and sells components, compressed air equipment, including: Condensate Drains, Oil / Water Separators,Refrigerant Dryers, Membrane Dryers, Air Chillers, Hydrocarbon Monitoring Systems and systems worldwide. Drain-All® Condensate Drains have been the industry leader for over 20 years. Drain-All’s extensive line of patented, zero-loss condensate drains provide energy-saving, performance-improving solutions for many compressed air and compressed gas system applications. Coxreels offer reels for all pressures and applications including low pressure air hose reels and water hose reels to 10,000 P.S.I. high pressure dual hydraulic reels for emergency rescue equipment. Their comprehensive selection of reels includes spring retractable, hand crank and motorized hose, cord and cable reels and their patented EZ-Coil® Safety Series spring retractable reels with controlled rewind. Reelcraft manufactures quality products, designed specifically to meet the needs of a variety of applications, big or small in all major industries such as manufacturing, automotive, marine, aviation, chemical, food processing, and electrical. Reelcraft hose reels, cord reels and cable reels are as durable and reliable as the workers who use them. Hosetract Hose Reels specializes in hose retrieval and storage devices. Concentrating only on Hose Reels, Hosetract manufactures high quality reels in Manual Rewind, Spring Retractable and Motor Driven. Hosetract Industries was formed in 1985 out of a need in the marketplace for trouble free, affordable hose retrieval devices. Balcrank Signature Series hose reels are engineered for the harshest environments and applications. The Evolution is lightweight but exceptionally tough. The Classic reel offers over a decade of reliable performance and is the perfect choice for general duty, automotive dealerships, and service garages. The Premium reel offers upgraded serviceability and advanced design features for long life in the toughest conditions while reducing overall weight. Elkhart Brass is the industry's leader and most experienced manufacturer of state-of-the-art firefighting equipment and fire protection equipment and is known for its commitment to quality, value and customer service. Found in fire departments around the world, their products have been trusted by firefighting professionals for over 115 years. Powerex, the leader in pure air technology, continues its commitment to design and manufacture compressors and compressor systems delivering your "pure air" requirements year after year. This world class technology has resulted from the combined engineering and production efforts of two of the largest compressor manufactures in the world, creating a new breed of oilless and lubricated compressor and vacuum systems. Mattei Compressors are the only choice for applications dependent on a continuous supply of compressed air. Mattei offers Industrial Rotary Vane Air Compressors. Beyond their exceptional technology and energy efficiency, what makes rotary vane compressors so unique is their universal demand. From agriculture to pharmaceuticals, and much in between, countless industries rely on vane compressors. Parker purification and separation technologies offer premium compressed air and gas purity, product quality, technological excellence and global support. Their products include Compressed Air Dryers, Gas Generators, Process Water Chillers, Compressed Air Filters, and Condensate Drains. Keckley offers industrial and commercial pipeline strainers and valves that are designed for a wide variety of applications. Keckley pipeline y-strainers & wye strainers offer a compact and economical means of straining debris from pipelines. Keckley Y-strainers are furnished standard with drain connections and pipe plugs. Eaton offers a complete Pipeline Strainer family including Y Strainers, Simplex and Duplex Basket Strainers and Automatic Backwashing Strainers. For over 75 years, Eaton Strainers have earned the confidence of thousands of users. They have led the way with designs that meet the ever-growing and rigorous demands of process and manufacturing industries, utilities, and municipalities. When it comes to straining foreign matter out of your pipelines in order to protect your equipment, Mueller Steam Specialty is a recognized leader in the pipeline strainer and valve industry. Mueller offers a wide range of strainers and valves. Mueller Steam Specialty is the world’s largest supplier of strainers, check and butterfly valves. Balcrank manufactures and supplies pumps, hose reels, control handles and used fluid dispensing equipment used in the automotive, commercial and industrial markets. Their products provide service for automotive quick lube facilities, dealerships, fleet, and commercial vehicle applications. Cleco Tools excels in manufacturing the best in Assembly Tools: Screwdrivers, Nutrunners, Impact Wrenches and Balance Arms. Cleco is a global leader in manufacturing and delivering world-class assembly solutions including DC electric and pneumatic assembly tools, and pneumatic power motors. Cleco has been recognized as the assembly tool standard by which all other brands are measured for over 100 years. Dotco is the #1 choice for Removal Tool Technology including: Drills, Grinders, Routers, Sanders, Buffers and Polishers. Cleco has been recognized as the removal tool standard by which all other brands are measured for over 100 years. The all new Dotco Sanders are ready to work as hard, and as precisely as you. The Airetool family of tools is one of the most diverse in the Heat Transfer Industry. With a broad selection of tube expanders, tube-rolling controls, tube cleaners and re-tubing tools for all applications. Airetool tube service tools have long been recognized as the standard to which all other brands are measured.